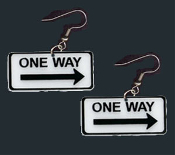 Huge Funky ONE WAY TRAFFIC ROAD STREET SIGN SIGNAL EARRINGS - Arrow points the way to punk fun! School Bus Driver, Crossing Guard, Police Officer, Teacher, Uber, Car Driver, GPS Travel Direction Novelty Replica Costume Jewelry - Big, Black and White, plastic charm, approx. 1.75-inch (4.38cm) Wide x 7/8-inch (2.19cm) High. It's MY WAY. or the Highway!